FILE - Journalist Pavel Sheremet talks on the air at a radio station in Kiev, Ukraine, October 11, 2015. The bomb blast was just 100 meters away, terrifying the skittish British businessmen who already were worried about whether Kyiv was safe. The explosion came the morning after Ukrainian translator Eugene Rysunkov had dropped them off at their four-star hotel. The Britons weren’t the only ones shocked by the July 20 car bombing that killed Pavel Sheremet, a pioneering journalist and radio talk-show host who left his home country of Belarus six years ago after run-ins with its autocratic leader, Alexander Lukashenko, and a suspended prison sentence. The high-profile murder in the heart of a district housing embassies and diplomats took Ukrainians aback — and police investigators now tasked with identifying the killers. 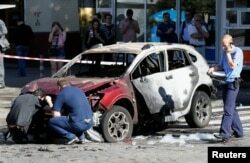 Sheremet was driving to work when a bomb exploded under the Subaru SUV belonging to his girlfriend, Olena Prytula, the former editor-in-chief of the newspaper Ukrayinska Pravda. She wasn’t in the car. The bomb had been triggered by remote control, investigators say, but they won’t confirm earlier statements by officials that the bomb consisted of 500 grams of TNT. “Assassinations are rare things in Ukraine,” says Viktor Gunko, the deputy chief of the investigations section at the Ministry of Interior. “And unusual when it comes to journalists in Kyiv,” he adds. Investigators inspect a damaged car at the site where journalist Pavel Sheremet was killed by a car bomb in central Kiev, Ukraine, July 20, 2016. Observing Ukraine from afar might strike some as an odd statement - Ukraine is hardly associated with peace these days. For 28 months, there has been on and off fighting in the east of the country, and images still remain fresh for many of protesters being gunned down in 2014 in Kyiv’s Independence Square as they battled to topple President Vladimir Putin’s ally, Viktor Yanukovych. In the past 25 years, journalists have been murdered or died in mysterious circumstances - 11 in all; but, with the exception of two killings, they took place outside the capital and involved local journalists prying too deeply into political corruption, organized crime or the affairs of oligarchs. One of the most notorious slayings came in April 1995, in Sevastopol, when Vladimir Ivanov, then editor-in-chief of the daily The Glory of Sevastopol, died four days after being blown up by a rudimentary bomb planted in a trash can. His murder came after he exposed some Crimea mobsters. He’d been campaigning also for semi-autonomy for the Black Sea peninsula - and doing so didn’t endear him to Ukrainian ultranationalists. The most high-profile murder of a journalist in Kyiv before Sheremet was in September 2000, when Georgy Gongadze, an editor at Ukrayinska Pravda, disappeared. A leaked recording that appeared to implicate then-President Leonid Kuchma and two senior aides in the journalist's disappearance sparked a huge political scandal. Sheremet’s highly public slaying smacks more of Moscow than Kyiv, say his friends. They compare it to the 2006 assassination in the Russian capital of journalist and human rights activist Anna Politkovskaya, who was known for her opposition to the Second Chechen War and was an uncompromising critic of Russian President Vladimir Putin. The assassination was meant to send a message, says Rybachuk. “It was a political killing and I think this goes back to the Russian intelligence services,” he says. Rybachuk links it to what he sees as Russia’s hybrid war against Ukraine involving on and off war in the east and disinformation. Rybachuk was on Sheremet's last radio show. “He had the gift of talking in a simple way about complex stuff.” They discussed political corruption in Ukraine; but, most of Sheremet’s focus was, as always, on freedom of speech issues and President Putin. “He had Russian dissidents often on his show - he was very well known in Russia,” Rybachuk says. Other friends say they wonder if the slaying was a domestic one. “Sheremet was also a threat to corrupt Ukrainian officials,” says Olexiy Haran, a political scientist at the National University of Kyiv-Mohyla Academy. Sheremet’s partner believes she and the Belarus journalist had been under police surveillance for months. Last week, police released video footage of a man and woman who are suspected of planting the bomb. Both suspects were wearing loose-fitting track suits and baseballs caps, which helped obscure their faces from the CCTV cameras. The woman appears to have planted the bomb. A Ukraine military intelligence official laughs at the killers’ appearance. “My suspicion is they were contracted local criminals. They looked like characters out of a Hollywood movie. They weren’t intelligence operatives and for me this points to Russia’s Federal Security Service rather than Russian military intelligence,” he says.